It was a moment he had hoped for all night. 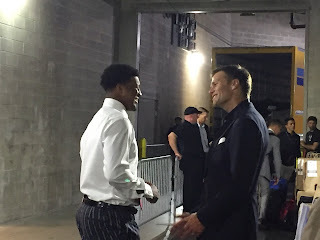 Earlier in the week, Tampa Bay Buccaneers quarterback Jameis Winston had mentioned how excited he was to see “one of the greatest quarterbacks to ever play the game” line up against him, but the situation had him wondering what to actually say to the New England Patriots’ quarterback Tom Brady, if he got the chance to meet him. And finally, after the Patriots’ 19-14 win over the Buccaneers, Winston got the opportunity to meet one of his idols. Brady also had kind words to say about the young, impressive quarterback. Tampa Bay ended the night in a hard-fought loss, but Jameis Winston is walking away happy and inspired.